With the World Cup now only a distant memory, focus shifts onto the upcoming Asian Cup. Over the next month Martin Lowe (@plasticpitch) will look over four West Asian leagues as they prepare to send their national team squads off to Australia. Here, he previews the Iranian Persian Gulf Pro League and how the national team’s exploits in Brazil have affected the domestic game. It’s been a good summer for Iranian football. An excellent World Cup by the national team has raised expectations of the year ahead, not only for their potential success at the Asian Cup in January but also of their domestic season which kicks off later this week. Similar to many of their West Asian rivals, the Iranian Persian Gulf Pro League (PGPL) has been the basis of the national side over the last few years. But while success on the international stage has put them ahead of the likes of Saudi Arabia, Qatar and the United Arab Emirates, the comparative wealth of their rivals has seen the PGPL fall down the rankings after a couple of average seasons in the Asian Champions League (ACL). In the last two editions, only one Iranian side on each occasion has made it out of the ACL group stage. This year saw domestic champions Foolad take that record only one step further, going out on away goals in the round of 16. While many suggest that Iran are punching above their weight against greater financial muscle, the success of the national team illustrates that they have a solid base to build upon. Signs that this could change are on the horizon. For years, keeping their top quality national team players was a given, with the odd couple impressing enough to move to Europe. However, the comparatively low salaries of the PGPL are coming into play with Iranian players eyeing a way out to rival domestic leagues in West Asia. In the last month, World Cup centre back Jalal Hosseini has joined Al-Ahli in Qatar from domestic giants Persepolis due to contract disputes, while many others threaten to leave Iran’s top clubs after not being paid. As national team stars garner further focus in the media and return with higher wage demands, the World Cup experience could eventually prove more harm than use. 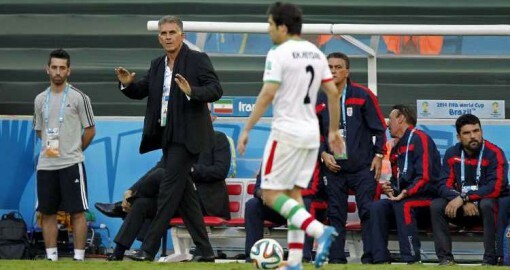 Keeping these players in-house is something the Iranian Football Federation (IFF) needs to focus on, but given the farcical dealings with the national team’s preparation for the World Cup and subsequent contract negotiations with the returning Carlos Queiroz, you’d worry for the state of the league unless the clubs take the lead. The need for constant improvement aside, the Iranian league is far from predictable. With no one team finishing in the top three in both of the last two seasons and three different title winners in three seasons, this one of the most intriguing leagues to watch as a neutral in this part of the world. Last season’s title race went down to the wire, with only four points separating the top five and wholesale changes in the ACL spots on the final day. Looking at this season’s campaign, champions Foolad have proved over the last year to be Iran’s best chance of success at home and abroad. However, success for a smaller club comes at a price with a couple of their notable stars moving on to the bigger clubs of Iran. Promising attacking midfielder and club captain Bakhtiar Rahmani, who broke into the national team ahead of the World Cup, remains for now, plus the additions of former Cameroonian international Mathias Chago and Honduran Brayan Beckeles will hopefully give them enough to threaten once again. Likely charges could come from those who finished outside of the ACL this term in the form of Tehran giants Esteghlal and 3 time champions at the start of the decade Sepahan. Both have spent wisely in the close season and could be the ones to beat this year. Esteghlal have brought in three new overseas players – Brazilian goalkeeper Rafael, Armenian Hrayr Mkoyan and Iraqi Karrar Jassim – but their real success could eventually be attributed to a strong Iranian defensive unit, with three of the back four present in Brazil and Andranik Teymourian dictating play from in front of them. Young centre midfielder Osmar Ebrahimi, a close season signing from Sepahan, could prove a sensational buy come May. Sepahan themselves are well represented in the national team also. Queiroz’s reserve keeper Rahman Ahmati and the impressive left sided player Ehsan Hajsafi will play a key role this term, while the acquisitions of veteran Reza Khalatabari from Persepolis and the free scoring Brazilian Luciano Chimba from Foolad will give the Yellows some extra instinctive finishing to turn their high amount of draws into wins, which was a common trend come the end of last season. Elsewhere, looking at those who have made it through to the ACL, Persepolis will hope to fly the Iranian flag internationally, but have struggled financially and could end up losing further players as the season starts. Left back Mehrdad Pooladi was highly impressive at the World Cup and could move to Europe, while Brazilian goalkeeper Nilson could be turfed off the wage bill since the arrival of Sosha Makani. The side instead will build around the talents of youngsters Reza Haghighi and Mohammadreza Khanzadeh, who will be eyeing a squad place at the Asian Cup with Iran, while goal scoring duties will fall to Reza Norouzi, who scored 11 goals for Naft last season. Cup champions Tractor Sazi, who have regularly qualified for the ACL over the last few seasons, have been hampered after losing international striker and golden boot winner Karim Ansarifard back to Persepolis after his loan period expired. The 24-year-old is an immense talent at this level but has yet to prove himself for a big club despite heading the goal scoring charts twice in the last three seasons, his final destination is yet to be decided. Naft Tehran, who themselves will be without their top scorer from last term, will also be fighting as an underdog against the more established Tehran clubs. The signings of Iranian international Gholamreza Rezai and Brazilian centre back Leandro Padvoni will bolster their squad. With confirmation that the ACL will continue with their West/East separation for the foreseeable future, Iranian clubs now know their competitors on the international stage in the coming years. Erratic league finishes seeing the more dominant and richer sides falling out of the ACL may prove an exciting watch for neutrals but further progression internationally could well be hampered. Looking at the pre-season transfer market, expect more of the same in the 2015 ACL edition for Iran.